Qosina offers an extensive line of pre-assembled extension lines available in a variety of configurations that are in stock and ready for immediate delivery. 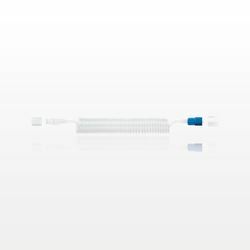 Qosina part # 33027 is a coiled LDPE extension line which features a female luer lock and male luer lock. Equipped with caps and an overall length of 78 inches, this extension line provides flexibility while helping to simplify the design and prototyping phases of your project. Our sales team can assist you in building a custom configuration to meet your project requirements.